We often hear from small business owners that they want a website but don’t have a lot of budget. We understand! You have many decisions to make for your business and there’s no shortage of places to spend money. It’s important to put thought into your website before building it out so you can be sure the end result meets your goals without breaking the bank. This is often the first question many small business owners ask themselves. But we’re going to challenge you to set this question aside—just for a minute—and answer the next few questions first. Then we’ll get back to this one. Promise. Short answer: Yes. You do need a website. 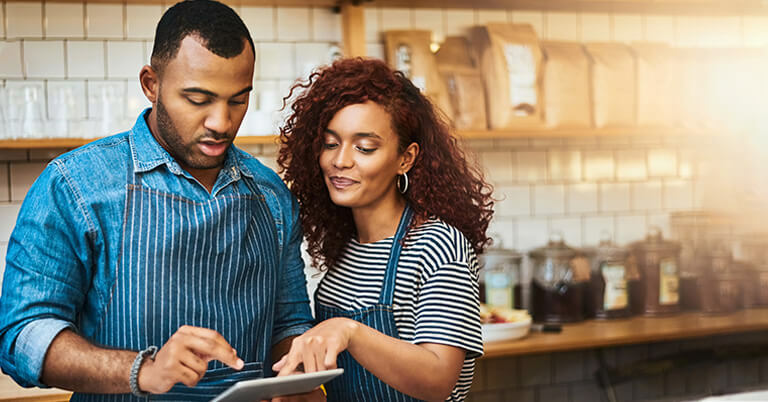 According to a study by Clutch.co, 36% of small businesses don’t have a website, yet “80% of internet users in the U.S. are expected to make a purchase online in 2019” and “over 5 billion Google searches are made every day” (from HostingFacts.com). Incredible numbers of people are using the internet every day. You could be missing out on key traffic. Your competitors might be scooping up traffic and leads that you’d be better suited for simply because they have a website and you don’t (or because they have a new, high-performing website and you don’t.) If you want to reach existing and potential customers, you really do need a website. What Goal(s) Am I Trying to Accomplish with My Website? If you sell products online, then your goal is likely to sell more—more products, more often, to more people. If you offer services, you might want to reach new customers online or better explain your services so that people are more likely to purchase your services. If you’re a nonprofit, you might want to increase donations or improve awareness of what your organization does. You can have more than one goal, but you do need at least one. “Have a website” is not a goal—it is a means to achieve a goal. If none of those fit, think about what does make sense for your business. Whatever you come up with will be how you can measure the success of your website (i.e. if your goal is to get more people to call, then you should see a higher number of phone calls after your new website launches). What Sorts of Things Do I Need My Website to Do? Mobile-friendly. More than 50% of web traffic comes from mobile devices, so you’ll want to be sure your site displays well for those users. SEO-friendly. Even if appearing high in search engines isn’t a huge part of your marketing plan, you do still want your site to be able to rank well for certain terms, so you’ll want to be sure your site is built with SEO in mind. After all, there are 5.5 billion searches per day. Social media. More and more frequently, people are sharing information, websites, and other content on social media, so you’ll want your site to display well when shared across platforms. With an estimated “2.77 billion social media users in 2019” (HostingFacts.com), this is a segment you don’t want to ignore. Having a website is a great first step, but how will you drive people to it? Word of mouth, business cards, SEO, PPC, email marketing, social media? All of the above? Having an idea in mind before you build your site can help inform the design process itself. For example, if you run a local pizzeria, then appearing high in the search results and map listings will be key to your business, and so having a site optimized for search engines will be important. If you sell products or services online, you might be planning to run paid ads to drive traffic to your site. In that case, you’ll want to build out dedicated landing pages for each ad campaign. You’ll want to consider the design of these pages as you’re designing the overall site. If email marketing is a big part of your strategy, you’ll want to have clear calls-to-action on your site encouraging people to sign up to your email newsletter. Even though these things could be added later, it’s good to have an idea of where you’re headed when building out your site. These days, many websites (especially for small businesses) are built in WordPress (in fact, 33% of all websites use WordPress and 60% of websites with a CMS use WordPress). Using a CMS like WordPress means you can easily update content on your site as things change with your business – store hours, pricing, product offerings, etc. Learning how to update your website is much easier than learning how to build it from scratch, so knowing you can update it yourself down the road might help justify the upfront cost of paying someone else to build it for you. OK, now we’re ready to address this question! When you receive proposals from companies offering to build your website, you might get sticker shock. It can seem like a lot of money for something that appears so simple to build. But now that you’ve asked yourself the questions above, you see just how much goes into a website. Or at least, how much goes into a website that is planned, designed, and built to meet your specific goals. To answer the cost question, you’ll have to calculate the value of a website for your business. What dollar value (or other value) do you anticipate getting based on your goals above? For example, if you currently sell 10 products per day for every 100 visitors, do you think you could sell 200 products per day to 1,000 visitors if you (a) had a better website and (b) drove more qualified traffic to it? How much would that increase in sales gain you? Weigh that against the cost of your website. Or maybe you’re paying someone to handle a process manually right now and once you automate that process on your website, you can free that person up to work on something more valuable to your business, like getting new leads or closing more deals. Weigh that against the cost of your website. Over time, your website investment should pay off. Your website should earn you money or save you time or both. And now all of a sudden, the price that might have seemed high now seems very affordable. How Do I Choose the Right Website Design Company for Me? It depends what you’re looking for. If you want a website quickly and cheaply, you can probably find a freelance resource to do it for you. If you want a quality website that meets your goals and pays for itself, you’ll want to work with a company that’s experienced in web design, and that will likely cost more. However, websites can be more affordable than you think. At Thoughtprocess Interactive, we have 20 years of experience in website design and development. We’ve worked with numerous clients over the years—from small to large, local to national, new to experienced—and one thing has remained consistent: our commitment to always listen to our clients and provide a quality website that meets their goals. If you’re looking for a new or redesigned website, get in touch with us and let us know your budget. We can scale up or down to design a website that meets your goals and fits within your price range.